The perfect gift idea for someone special! 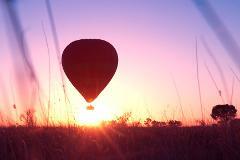 Whether it’s a significant birthday, anniversary or ‘just because’, there is no better way to celebrate than with a balloon flight as the morning light begins to illuminate the MacDonnell Ranges. The perfect gift idea for someone special! Whether it’s a significant birthday, anniversary or ‘just because’, experience the breathtaking feeling of floating silently above the Outback as the morning light begins to illuminate the Ranges.